Everyone says that Grace's mother died in an accidental fire. 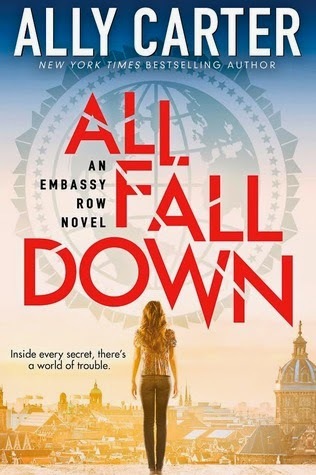 Everyone says that except for Grace, who claims that she witnessed her mother being murdered in the ambassador's (who also happens to be her grandfather) house in Embassy Row. Years later, Grace is finally back at Embassy Row and, as you can guess, things start heating up. A personal favorite aspect of this story was seeing the tenants of Embassy Row humanized. We don't just have Americans, but we meet Alexei, who lives in the Russian house next door. We meet Noah, who lives at both Brazil and Israel because his parents are divorced. We meet others as well, briefly however, but it was still a fun experience for me. It's set in Adria, a fictional European country, but Carter gives the right realistic feel to it. How she describes the Iran house is almost chilling. I think it's even more so because I remember seeing a post written by her saying how she saw the Iran house in an actual Embassy Row here. Abandoned, dark, mysterious. Like with all the other houses, they talk about the Iran house as if it's Iran. They say things like "don't go to Iran," which is a poor example and not a real quote, by the way. As for the plot, it was slow at first. I've been a mega-fan of Ally Carter for a very long time, but this one took a little more time than I expected to really sink my teeth into. I always love Carter's writing, but Grace's narrative was uneasy for me. I told myself I wouldn't, but I expected to see more Cammie in Grace than I did considering how much their experiences were similar if you compare the fifth book in the Gallagher Girls to this (in terms of memories and family). Once I fully realized that and pushed the comparison and expectation aside, I truly started to like the book more. It also helped that the plot seemed to pick up more. One of the best ways to make me appreciate a book: get me to like the secondary characters. I was already becoming increasingly aware of the other characters, but as the plot thickened, the characters deepened. Even though I was suspicious of him for most of the book, I couldn't resist liking Noah from the start. He declared Grace his best friend from the start, which reminded me of an adorable kindergartener. We don't see too much his twin sister Lila, although she has an important part early on. But between his sense of humor and just Noah being Noah, I felt like he was a keeper (friend-wise). "You're not the one who owes me," I point out. He nods. "Yeah, well, Lila is . . . Lila. I'm just grateful she didn't eat me in the womb." Of course, this is a good time to mention the great things about platonic relationships. Romance isn't focused on much in this book, and while I was nervous that we would go into love triangle territory, Carter didn't let me down. Carter may have hinted in the beginning, but for the future books, I'd bet that there will only be one path for Grace. And in true Carter fashion, it will be slow-burn. Other secondary characters that deserve recognition is Megan, another American who used to be friends with Grace when they were younger. Although their relationship grew tense, I was actually on Megan's side. Rosie, a younger girl we meet and becomes part of the group, reminds me of Liz from Gallagher Girls and Sloane from The Naturals. I know I said I wouldn't compare, but come on, tell me you don't see a huge resemblance. Ms. Chancellor, who's like a surrogate grandmother to Grace, became a favorite of mine. I admittedly had a growing suspicion of her and I won't say anymore, but she deserves a shout-out for the following scene. "He said man stuff," I tell her as we walk away." "Are you okay with that? Tell me you are not okay with the phrase man stuff." "I am not," she says through a too-bright smile. "But Queen Catalina bided her time and ruled for sixty years, my dear." "So you're going to kill the prime minister in his sleep?" I ask. She never softens her smile. "No. But that doesn't mean I don't appreciate the power of patience." Sure, I wanted to tell off the prime minister along with Grace, but Ms. Chancellor showed a prime example of picking your battles. And I firmly believe that she has the incredible power of patience and the power of killing powerful men. In the latter half of the book, things speed up more, and Carter manages to surprise me. Having Grace as the narrator provides an unreliable view, which is mostly exciting because you're always on alert. You don't know what you don't know or don't see because we're getting it all filtered through Grace. While not a favorite Ally Carter book of mine, it still provided the reliable entertainment factor and enjoyable characters. I'll definitely be reading the sequel as soon as it comes out, especially considering that it ends right when it has all of my attention. Yes, it had great moments and intrigue and conversations, but it had a "first book set-up" vibe to me. Even so, I enjoyed it. In the mean time, I think I should reread The Gallagher Girls and Heist Society again. What's your favorite Ally Carter book? Now that choir competition season is over (until state qualifications in May), I SWEAR I'm going to start commenting on your blog again, and this seems like a good place to start. I'm SO glad this book didn't let you down, even though it's not your favorite Ally Carter. For some crazy reason, I have yet to read All Fall Down, so if it disappointed you, I'd be extremely nervous. The best part of your review is the very beginning when you talk about the author's portrayal of people from around the world. I can't wait to read about them and learn more about their nations of origin! And a character comparable to Sloane and Liz? YES. I need to fix the fact that I haven't read this book NOW. So glad you liked this book! I have All Fall Down sitting on my shelf, in line to being read, and I am seriously hoping it's a good book. I always love Ally Carter's books, and I'm hoping this one isn't an exception. My favorite book by Ally Carter would have to be Heist Society. Sounds like it had the typical intro-book slowdown, but I'm glad it picked up by the end. Great review! I heard this reads a little younger but was fun. I haven't read anything by Carter yet and this sounds good to me.